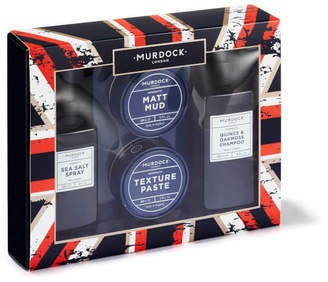 Create effortless body and texture with the Murdock London Heroes Artful Gift Set , a haircare kit containing four products to expertly shape, sculpt and style your strands. Each product contains a recipe of nourishing ingredients to keep hair healthy. Free from parabens, phthalates, sulphates, PEGs and synthetic dyes. The Set Contains: Sea Salt Spray (150ml) The texturising spray is any barbersâ€™ first step for good style. Enriched with Sea Salt, the styling spray creates body and touchability with a matte finish, allowing you to add definition and shape to your hair. Use alone on wet or dry hair, or with a hair tin for a more defined look. Infused with natural oils and extracts to create a refreshing scent. Texture Paste (50ml) Create a range of hairstyles with a styling paste that provides soft hold with low sheen. A must-have for styling, the low-shine texturising paste adds shape and separation to strands and utilises Diatomaceous Earth and Vitamin E for a flexible finish. Pliable and easy to use. With normal usage, one tin will last 3 months. Matt Mud (50ml) Showcase your style with a best-selling shaping clay with firm hold and matte finish. Delivering strong, shine-free hold, the hair styling clay is pliable and easy to use, allowing you to experiment with a range of looks, from a dishevelled bedhead to a sleek pompadour. Contains Kaolin and Vitamin E for firm hold with a dry finish. Quince & Oakmoss Shampoo (250ml) A sulphate-free shampoo that performs a gentle yet effective cleanse on the hair and scalp. Cleansing away dirt and impurities without drying the scalp or follicles, the purifying, regular use shampoo will help to create a healthy scalp environment to promote good hair health.